It is important to be aware of the normal anatomy when analysing MR images. However, the anatomical structures are not always visible. The ventral sacroiliac ligament is thus sometimes, but not always visible at MRI. The MR image (semi-axial T1 FS + Gd.) 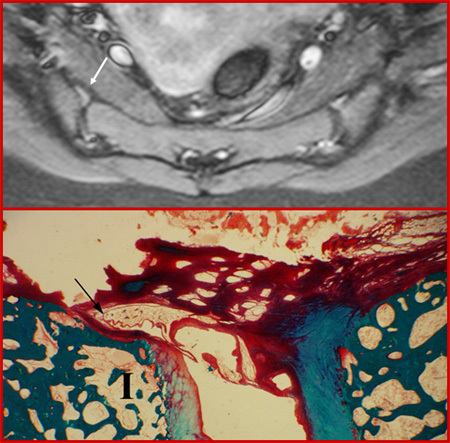 does not visualise the ventral sacroiliac ligament on the left side, but it is clearly demonstrated on the right side (arrow). The microscopic image is shown for comparison. The synovial pouching at the distal part of the joint may sometimes be visible in normal persons. STIR image demonstrating fluid filled pouching anterior as well as posterior in both joints (arrow). A microscopic image of the region anteriorly is shown for comparison. There can be ligaments attached deeply in the iliac bone at the border between the cartilaginous and the ligamentous joint portion. The ligaments are surrounded by vessels and may on coronal slices simulate erosion. The images demonstrate a semi-axial T1 FS + Gd. 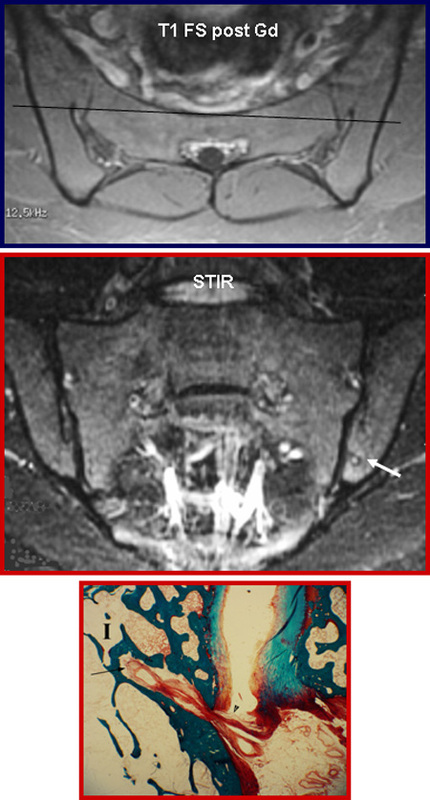 slice with deeply attached ligaments which on the semi-coronal STIR can simulate erosion (arrow). The localisation of the coronal slice is marked with a line on the semi-axial image. A microscopic image of the ligamentous structure surrounded by bone is shown for comparison. The area of ligament attachment in the iliac bone can display non-specific oedema and/or enhancement probably due to strain. This should not be mistaken for erosion. The images encompass a semi-axial T1 FS + Gd. slice with slight enhancement at the ligament attachment. 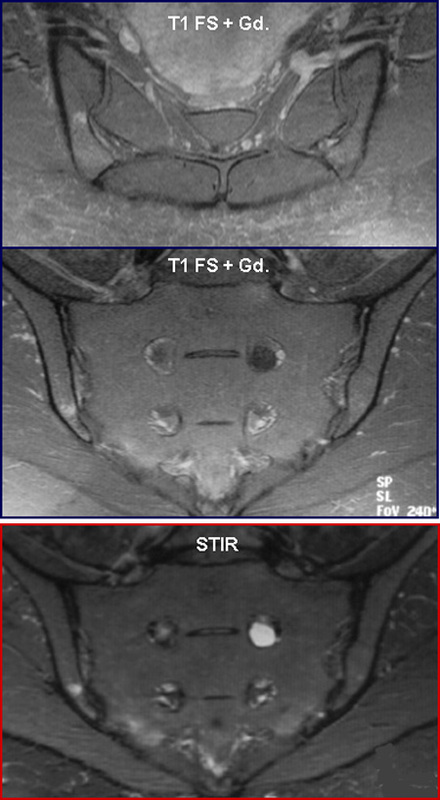 On semi-coronal STIR and T1 FS + Gd. the area can simulate subchondral inflammation.